The origins of Wakes Cakes dates back to the 7th century. Wakes days (and later weeks) in Britain were periods of localised celebration in honour of a patron saint of a particular church or parish. It was traditional to keep watch, or ‘wake’, in church on the eve of the dedication day, but over time the wake became an evening of feasting, often in the church-yard. This gradually degenerated into drunkenness and rowdy celebrations, and increasingly wakes became more secular in character as the churches condemned the behaviour on its premises. Wake Days became linked eventually with fairs, holiday days, then eventually in the 19th century to short holiday periods for workers in the factory towns of Northern England and Scotland. Before 1914, working class people had to be content with the odd day trip or few days unpaid holiday. 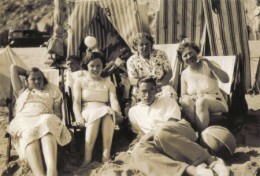 But in the 1930s legislation was introduced to make a week’s paid holiday compulsory. 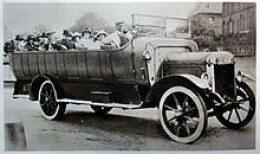 Many flocked to the seaside by train or charabanc (see photo), to lively resorts, like Blackpool, Scarborough and Morecambe, to stay in guest houses for a week. If you had pretensions for the posher side of the tracks though, you might go to the more genteel Yorkshire resort of Filey, or Lancashire resort of Southport. The less affluent, to save on money, took as much food with them as they could carry, including Wakes Cakes. These cakes were rich in butter to preserve them over a longer period. They were also cooked into large thin rounds to make storage in luggage or food trunks easier. Every mill town had its own Wake Cake speciality, with their own blend of ingredients, but this rich, plain recipe originates from the Yorkshire/Lancashire border where I live, and is typical of many. It dates from the late 19th century. Mix flour and salt, rub in butter, add sugar and dried fruit. You can more or less dried fruit according to taste - I opt for more. I usually cut down on the sugar though, to 3oz, rather than 4. If you have a sweet tooth, stick to 4oz. Knead the dough lightly, then roll to the thickness of a coin (about an eighth of an inch). Bake in a moderate oven for 15 minutes, or until golden. Enjoy! Will keep for a few weeks if wrapped in foil. You can find variations to the basic ingredients around Lancashire and Yorkshire, according to the mill town. 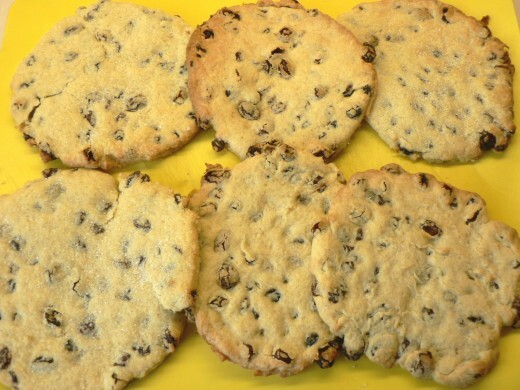 But the basic recipe shown in this article is typical of most Wakes Cakes in the region. By the late 1930s, all the textile factories closed for a paid summer holiday week, leaving towns empty in those periods. Local railway stations would be swamped on the first day of the holiday – the small station of Brighouse had 3,000 people descend on it the first day of the Halifax Wakes – and many neighbours chipped in and hired a charabanc to take them to and from their holiday venues. Whole streets would often go to the same seaside resort. The holiday weeks would vary from town to town, by mutual arrangement with the respective mill owners, but were inevitably between June and early September. Workers could save for the holiday over the year by paying weekly into a Wakes Club, usually organised by the trade unions. The mill workers and their families would flock to the seaside, praying for good weather. They would take as much food with them as they could carry to save on money. The food they took to the guest house was stored away – every family had its own cupboard space – and the landlady prepared it for their evening meals. This was not without its problems though: “children of impoverished families could see what others, from more well-to-do homes, were having. There were angry questions – sometimes tears” (p.80).